I am pleased to report that my new paper "A population genetics-phylogenetics approach to inferring natural selection" is published today in PLoS Genetics. This is the culmination of two years work at the University of Chicago with Molly Przeworski, plus a good deal of follow-up since I moved to Oxford. In the paper we introduce a new way of combining population genetics and phylogenetics models of natural selection, and a statistical method (gammaMap) for estimating parameters under the model. 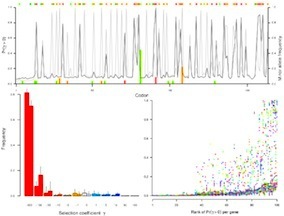 From a collection of sequences within one or more species - in the paper, we use 100 X-linked coding sequences that Peter Andolfatto produced in Drosophila melanogaster and D. simulans - the method allows you to estimate the distribution of fitness effects within each lineage, and localize the signal of selection using a Bayesian sliding window approach. Using Ryan Hernandez's simulator SFSCODE we tested the method for robustness to demographic change and linkage disequilbrium, and we investigated the effect that common assumptions concerning spatial variation in selection coefficients (sitewise, genewise and sliding window approaches) have on inference of selection. During the winter break I will work on compiling the program for different platforms and writing the documentation, with a view to releasing the software early in the New Year. Subscribe to this blog for updates or - if you are too impatient to wait - send me an email.